The Staircase to the Moon is one of nature’s marvels, and one of the sights that many people plan their visit to Broome around. I didn’t – but I was lucky enough to be there during the two or three days a month that it occurs. 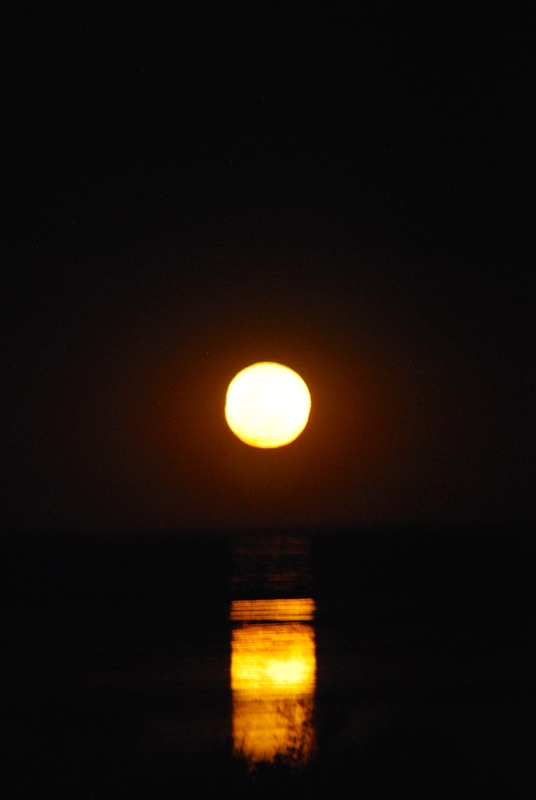 This wonderful optical illusion occurs a few nights each month between March and October when a full moon rises over Broome’s Roebuck Bay. The stream of moonlight reflected off the exposed mudflats at low tide creates the illusion of stairs reaching all the way to the moon. It’s simply amazing. This photo – the only one of many I took to come even close – doesn’t quite capture the full effect (but I was pretty happy with it anyway). You can see it from any vantage point overlooking the bay – there are expanses of vacant land as well as Town Beach, or the beer garden at the Mangrove Hotel (where the early evening shot at the top of this post was taken on another night). Take a tripod and a decent camera if you really want good images, because it’s pretty hard to get a good shot. And get there early – I was quite astonished by the crowds and there was a bit of jockeying for a good view among those keen to get photographs. Otherwise, just enjoy the fabulous sight before you and forget about photographs (there are plenty of postcards and photography shops in Broome where you can buy them). This month, there are two sets of dates when the Staircase to the Moon will be visible, the next on August 30-31. For a full list of dates when Staircase to the Moon occurs, click here. A Glass Half Full travelled to Broome as a guest of Australia’s North West Tourism. Here in beautiful Moreton Bay, I’ve seen a staircase to the moon from the balcony of my apartment, Lee. A marvellous site without even leaving my lounge chair! Wow! Really…I didn’t know it happened here too. Don’t tell anyone!! Always wanted to see this beautiful sight – always missed it by weeks . . . Thanks for sharing! Yes, really is worth planning for (if you can). This is amazing, Lee! I have added it to my bucket list. Must see in person:). Well, when you get to Australia…don’t forget to look me up! And yes, this part of Oz should definitely be on your list!